"Don't be fooled! Make believe canoe brands from the Big Box Store are NO Bargain... The Box store makes up a brand name and has the kayak made in China or Thailand. Shop at the box stores and you'll find you're on your own both before and after the sale. Hoping that you've made a good choice rather than knowing you've bought the best value for the priorities you have and the waters you want to explore. NOTICE... The company that makes the Royalex material for OLD TOWN and all other canoe brands has stopped production. We offer Old Town Canoe Shipping to your Home, Business OR pick-up at your nearest Freight Terminal. For over 30 years, Old Town's Discovery series of canoes has shown the World how durable, stable and affordable canoes can be. This fine solo canoe is agile, stable and easy to handle. It's even well-suited for a single OR a double-bladed paddle. Thanks to our construction process, it's tough without being too heavy. Let our Discovery 119 help you explore new territory. 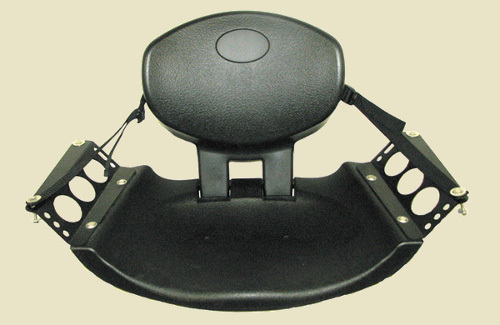 • Web seat (shown) provides low center of gravity and lots of stability. • Portable and manueverable for Solo use. • Well-suited for single OR double-bladed paddling. PolyLink3 11' 9" 32.5" 13.5" 49 lbs. 450-500 lbs. Next PolyLink3 13' 29" 11.5" 59 lbs. 450 lbs. 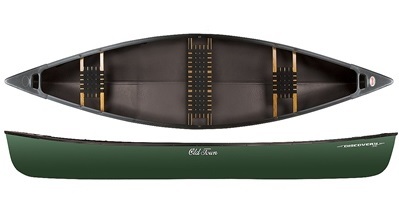 Old Town Guide canoes represent a breakthrough in design and construction that provides a durable, stiff and affordable canoe. With its unique cross-section and stabilizing chines, the Guide 147 delivers exceptional stability, as well as rugged durability. And its sharp entry provides a surprisingly efficient paddling canoe. Stable enough for fishing or nature watching, yet versatile enough for family outings - all at an affordable price! At Oak Orchard you can choose from the Saranac with a single layer hull OR the more rugged Guide canoes with a 3 layer hull... all made by Old Town. Guide 147 PolyLink3 14' 7" 38" 13" 74 lbs. 850-900 lbs. Our Guide canoes represent a breakthrough in design and construction that provides a durable, stiff and affordable canoe. With its unique cross-section and stabilizing chines, the Guide 160 delivers exceptional stability, as well as rugged durability. And its sharp entry provides a surprisingly efficient paddling canoe. Stable enough for fishing or nature watching, yet versatile enough for family outings - all at an affordable price! Guide 160 PolyLink3 16' 39.5" 13.5" 82 lbs. 1200-1250 lbs. The Camper is a highly responsive boat that's lightweight, easy to maneuver and built with added depth for an extra margin of security. This canoe is large enough for the family yet lightweight and versatile enough to explore backwaters and take a solo daytrip on local streams. 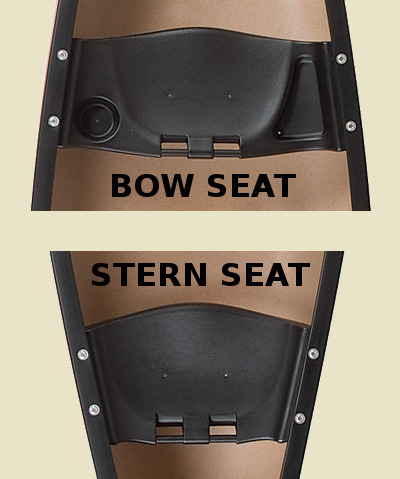 • Wide flat bottom with rounded entry provides high stability and maneuverability. • Super Durable multi-layer ROYALEX hull material is also light weight. Camper 15 Oltonar/Royalex® 14' 10" 36" 13.5" 57 lbs. 900 lbs. Camper 16 Oltonar/Royalex® 16' 36" 13" 59 lbs. 1250 lbs. An excellent choice for the whole family or two paddlers plus gear. Good tracking and ease of paddling with moderate to heavy loads. The Penobscot 17s sharp-V entry and shallow arch bottom attest to Old Towns unique design capabilities. Super Durable multi-layer ROYALEX hull material is also light weight. 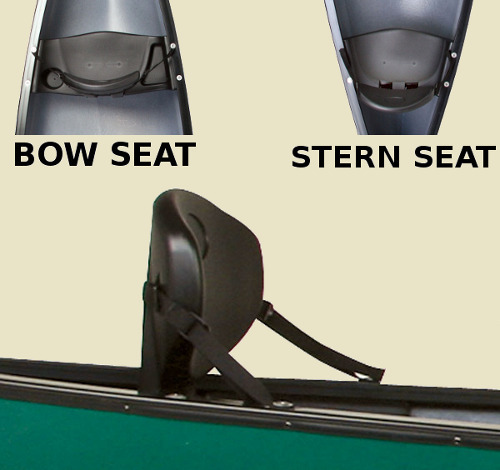 The Penobscot 17 is an excellent choice for lakes or rivers that can still handle class II rapids with ease. Oltonar/Royalex® 17' 1" 35" 14.5" 65 lbs. 1100 lbs. A big wide stable craft designed for sportsmen. Compact enough for the back of a pickup truck. We offer these with different outfitting to suit your needs. The Discovery 133 has a dark green exterior with a shaded interior. With its 800 pound carrying capacity, there's plenty of room for you, your partner and your gear. The 40.5" beam ensures maximum stability for shooting, casting and taking pictures. Heavy duty Polylink3 hull is as close as you will get to indestructible. • Center Seat. • Oarlocks. • Vinyl gunwales. • Clamp-on Side Mount motor bracket. • Clamp-on Scotty Rod Holders. • Anchor system - raise, lower and lock anchor without leaving your seat. • Removable work decks with zippered mesh pockets. PolyLink3 13' 3" 40.5" 14" 78 lbs. 800 lbs. Discovery Sport 15 (shown) has a dark green exterior with tan interior. Predator ss150 is camoflage inside and out... these are the same hull, just different outfitting. Paddled, rowed or motored, our square stern Discovery Sport 15 offers steady stability and great versatility. It can handle up to a 5 H.P. outboard motor, yet is small enough to be car-topped or carried in the bed of a pick-up. Optional Power Paddle electric motor available. 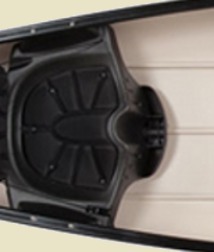 Polyethylene decks with grab handles. 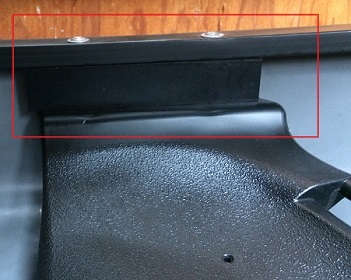 Vinyl gunwales. Square stern. Web seats. We also stock an Angler version of the Discovery Sport which includes 2 Scotty rodholders, oarlocks and 2 Sitbacker backrest seats. The Predator ss150 is made in the same mould and has the same specs as the Discovery Sport but it is camoflage and comes with a work deck, a Scotty Anchor lock, and oarlocks. Check out our New "POWER PADDLE" electric motor from Old Town, it's really quiet -great for fishing!